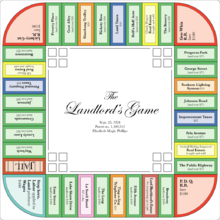 The Landlord's Game is a board game patented in 1904 by Elizabeth Magie as U.S. Patent 748,626. It is a realty and taxation game, which is considered to be the direct inspiration for the board game Monopoly. In 1902 to 1903, Magie designed the game and play tested it in Arden, Delaware. The game was created to be a "practical demonstration of the present system of land grabbing with all its usual outcomes and consequences". She based the game on the economic principles of Georgism, a system proposed by Henry George, with the object of demonstrating how rents enrich property owners and impoverish tenants. She knew that some people could find it hard to understand why this happened and what might be done about it, and she thought that if Georgist ideas were put into the concrete form of a game, they might be easier to demonstrate. Magie also hoped that when played by children the game would provoke their natural suspicion of unfairness, and that they might carry this awareness into adulthood. In 1903, Magie filed for a patent on the game which was granted in 1904. Magie and other fellow Georgists formed a company, Economic Game Company, in 1906 New York to publish the game. Besides Magie, the incorporators were E. H. Monroe of Chicago and E. G. Lenbusher of New York. Magie approached Parker Brothers to publish this and one other game in 1909, the other game was accept while Landlord's was rejected as too complicated. In the United Kingdom it was first published in 1913 by the Newbie Game Company, formed by a Liberal Committee from the village of Newbie in Dumfries, under the title Brer Fox an' Brer Rabbit, although despite the title change it was recognizably the same game. Landlord sold well in the Northeast amongst its left-wing intellectuals, while Brer was unsuccessful. Scott Nearing, socialist professor of economics at Wharton School of Finance from 1906 to 1915, lived in Arden in 1910, where Magie invented the game, learned about the game and taught it to his students. College students made up their own boards to use with her rules. The game spread particularly the monopolistic rule as "monopoly". With the first patent expired and Nearing putting his version out in 1923, Magie decided to attempt to regain control by applying for another patent. 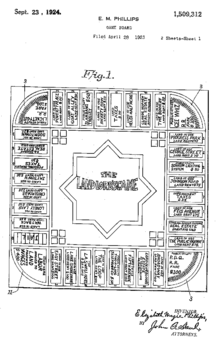 On September 23, 1924, a second patent was issued to Magie for the Landlord Game. Adgame Company (Inc.) published Landlord's Game and Prosperity under this patent in 1932. Various version of the game popped up in the almost 30 years since the original game was created going by various names: "Monopoly," "Finance," "Auction." amongst the Atlantic City and Philadelphia communities of Quakers, the game was particularly popular and continued popularity with college students and economy professors. Jesse and Eugene Raiford, Quakers in Atlantic City, used household items instead of pawns and changed the properties to those of Atlantic City. Robert Baron had Parker Brothers design its own version, Fortune before negotiation to purchase her patents in case the discussion fell apart or she sold to other, potential Dave Knapp, publisher of Finance. Magie held the patent until 1935, when she sold it to Parker Brothers for $500. The company had recently started distributing Monopoly, which it purchased from Charles Darrow who claimed to have invented it. The company only print a small run of the game. Parker Brothers pushed her game aside for Darrow's by 1936. Magie then did two interviews with copies of the original board with The Washington Post and The Evening Star to show that Darrow was not the inventor of the monopoly game. In 1937, Carnival was published based on the 1904 version. Parker Brothers published their edition of the game in 1939. In a 2004 episode of PBS' History Detectives (title: Monopoly; Japanese Internment Camp Artwork; The Lewis and Clark Cane), the show investigated a game board belonging to a Delaware man, having an intermediate version of a game combining elements of The Landlord's Game and Monopoly. The investigators concluded that this game board was the missing link that proves that Monopoly was derived from The Landlord's Game. The set had rules for two different games, anti-monopolist and a monopolist. The anti-monopolist rules reward all during wealth creation while the monopolist rules had the goal of forming monopolies and forcing opponents out of the game. A win in the anti-monopolist, or Single Tax version and later called by Magie as "Prosperity Game", was when the player having the lowest monetary amount has double his original stake. The board featured a track around the outside edge of the board split into blocks representing properties and had their purchase price, and their rental value listed in the block. New York City’s Broadway, Fifth Avenue, and Wall Street were the top properties in price and rent. The published game included Chance cards with quotes attributed to Thomas Jefferson, John Ruskin and Andrew Carnegie. From the 1904 patented version to the published 1906 version, the property names were changed and the rule for increased rent for multiple railroad owned. The game's first patent was the first issued for a game while claiming four features in the application, the most important features was continuous path game. At the time, most game had a start and end spot. With the first patent expired and Nearing putting his version out in 1923, Magie decided to attempt to regain control by applying for another patent with five claims.